In those weeks following the September 11th attacks, it was only the serious, angry sounds of fighters, F-16s from Buckley Air Force Base, screaming straight west over our house, flying CAP – Combat Air Patrols; practicing to attack something with a vengeance; they would quickly reign death on anything that would even think about making a malevolent move on Denver. 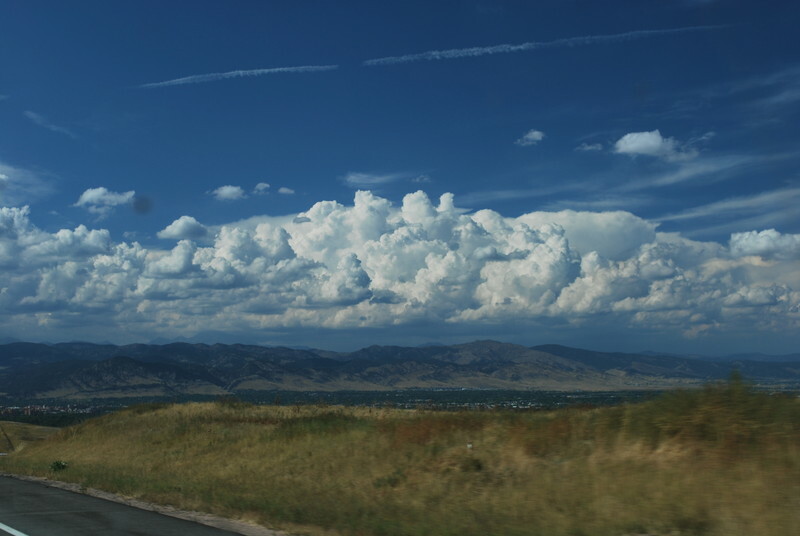 Ironically, and in a twist that would churn up yet another sad day in our memories, as my wife and I would look west from that window to view the empty sky, so strange, devoid of any airplanes, we were forced to look toward and beyond Columbine High School to take in our view of the mountains. Another place where “it” was no accident. We had gone to the school three days after the murderous rampage there in April of 1999. I think we felt as so many did, compelled in some way to be close to the now sacred site, close to the kids and teacher who were gone now, and to be part of the support for their families and friends left. We walked in the snow up a trail and across the school grounds to see Rachel Scott’s car, a small maroon import, covered with flowers and notes and snow, this place now full of people congregating mostly in stunned silence, and sadness. It was as if it were now frozen in time and place – and it literally was. Now in the last weeks of September and first week of October 2001 that familiar stillness enveloped everything again. It was only those planes – the fighters – in our skies in the weeks after; a strange yet comforting phenomenon, every other kind of flying being grounded. We were reassured to see them, or at least to hear them. Many of those F-16 pilots were friends of mine. I had worked at the 120th Fighter Squadron in the first couple years I was in Denver. I had also traveled to Alaska with them and briefed them daily after the shoot-down of Capt Scott O’Grady in Bosnia. The Serbs had used the Soviet-built SA-6 in an unconventional way, and the result was devastating. Outside the strict bounds of Soviet-era Surface-to-Air Missile (SAM) employment doctrine, one system was connected via fiber optic cable to a second SA-6; one operating only as the Shooter, the other providing the Radar for search and track, target acquisition, and fire control. The effect was that the F-16s only “saw” the SA-6 Radar, and did not know of the Shooter several miles away. It nearly proved fatal. It seemed to be the human drama of O’Grady’s shoot-down – his Falcon was hit just behind the cockpit at the rear of the canopy, and fortunately, as the fuselage disintegrated into two large pieces the cockpit fell away fully intact – that played out so well on television and grabbed everyone. It was this and his subsequent evasion of the hostile forces in the Bosnian forest that were preeminent with the news media and drama-seeking general public. But it was the technical and tactical aspects of how the SA-6s were employed that concerned the Redeyes of the 120th, not the human drama. Except that there was a brief flurry accusing O’Grady of ineptitude – one of the pilots had gone to flight school with him and derisively claimed, “The guy didn’t know what he was doing anyway.” As is oft times the case, fighter pilots are ready with jokes and quips to cover and deal with the terrifying underlying truth that they could never escape: “It could have been me.” These kept their interest in my daily Technical Intelligence Briefings and situation updates. They were not the only ones I had a close connection with. The Racers of the 113th Fighter Squadron in Terre Haute were my home unit, where I first joined. I retained a keen impression from childhood of the thrill and power of fighter jets when I had gone to air shows with my father in the late 1960s and early ’70s. They were flying F-84s then and later F-100s. I was small when I knew I wanted to be part of it, and as with several of my close friends, joined the Indiana Air National Guard soon after college. And it was with them that I shared my first encounter with the dark, painful side of that life. 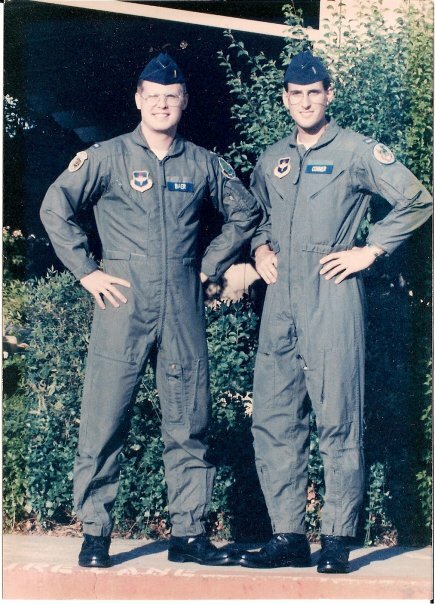 I had gone to flight school – SUNT, or “Sun T” – Specialized Undergraduate Navigator Training – at Mather AFB in California with my close friend, Andy Baer and it was just five years later that he and another squadron mate and friend Ralph Miller were killed in the crash of their F-4E in the Nevada desert while flying intercepts on September 19th, 1990, training for a war in Iraq we were all sure was coming.